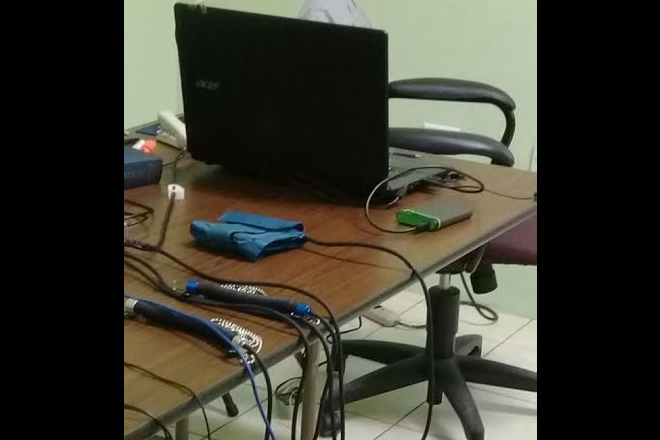 Polygraph Screening Station - RSCNPF, All Officers assigned will be screened in coming weeks using this or a similar system. (RSCNPF): As the Royal St. Christopher and Nevis Police Force continues the transformation into a modern day Police Service; one built on integrity and service delivery, new policies and protocols are being put in place to ensure both. One such new protocol is the introduction of Polygraph Technology in the recruiting and selection process. Over the last months, all recruits in “Training Class 41” were screened using Polygraph Technology. Commencing this week, all Senior Officers of the Police Service will also undergo Advanced Security Screening. The screening of Senior Officers was first announced by Commissioner of Police Mr. Ian M. Queeley in January at his New Year’s Lecture to the Police Service. Commissioner Queeley said, “as we continue to look at criminal activity both within and outside of our borders, in order for us to be most effective we must operate in an environment of continued trust.” He added, “our country expects the highest standards of integrity in those we entrust with the security of our nation and so, as Commissioner, I have decided that there is no more a transparent way than to employ the most advanced security screening for our officers. Starting this week we will screen all of the Senior Officers, and then begin to screen all other Officers within Police Service. Every Officer will be screened to ensure continued suitability for their current and future assignments within the Police Service.